Independence Square, Accra, originally uploaded by nobodaddy69. Although Accra is a little short on parks and green space, it does have a set of spaces in the city centre which enable Ghanaians to participate in their national identity through public space. 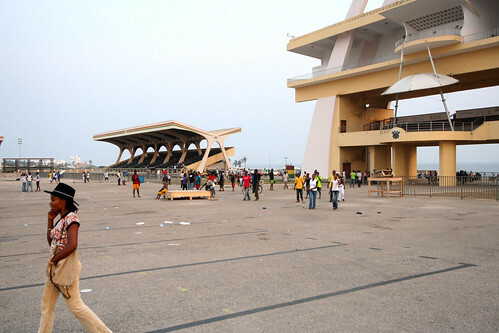 Alongside the Kwame Nkrumah mausoleum (which includes a small park and museum), Independence Square and the nearby Independence Arch place the event of post-colonial independence (in 1957) in physical space. Ordinary citizens are free to engage in the space as they wish without any oversight of the state. Some choose to sit in the seats, others to stroll across the square on their way to the beach. In this way, citizenship is embedded and normalised within the fabric of the capital city. Wow.....what a great place in accra? I have visited accra by Cheap Flights to Accra.